When Paumanok Vineyards' Charles Massoud planted his vineyard in 1982 with his wife Ursula, there were only a handful of vineyards on Long Island. Over the subsequent 20-plus years, Charles, Ursula and now their sons -- this is a true family-run winery -- have worked hard to put and keep Paumanok Vineyards in the upper echelon of wineries on the East Coast. Charles takes a very pragmatic approach to running his winery and, over the years, he has seen wineries come and wineries go. He's seen wineries, including his own, succeed not only with critics but also in the New York City market. Carlo DeVito make a lot of good points, but I'd like to add some of my own as well. New York city has embraced Long Island wines! We used to play victim, complaining that New York City turns its nose up at Long Island wines. No longer true. Over the last few years, of the top 50 Zagat restaurants almost all have at least one Long Island wine on their list and pour by the glass. There are at least ten Long Island wineries doing a brisk business in the city. So let us stop saying we should raise our profile in New York City. We have. It has worked and it will benefit the rest of those in the industry who will craft high-quality wines. Those who stick with low quality swill, nothing will help them. There are some terrific wines being made in New York and the critics, for whatever it is worth, have said so. Robert Parker's Wine Advocate has given ratings from 90 to 92 to more than 100 New York wines. The Wine Spectator has likewise been rating New York wines higher than ever, having invited several Long Island wineries over the years to its major event, the NY Wine Experience. These are the leading indicators. If you wait for the government to help you, I would suggest you might do better with Santa Claus. The industry must help itself. Or go out of business. New York's wine image isn't where it needs to be. A report published by Wine Market Council titled "U.S Wine Markets Trends and Analysis," page 62, states "New York wines ranked lowest in quality compared to all of the other states." This was made available to us last December. Based on this I issued a call to action and included the NYWGF, the Long Island Wine Council and about twenty wineries. I asked if there would be any interest in exploring how we might, as an industry, positively change our image to reflect the leading indicators mentioned above. There was polite interest by some but in the end I was left alone to conclude that the real problem is the lack of understanding of marketing by New York wineries. In general, those who are serious will work hard at creating good wines and wait for the world to beat a path to their door. And wait they do, which drives many of them to start a circus at the winery to attract tourists and -- by the way -- sell them some wine. They certainly do not understand that this brings down further the image of their wine. Because if the wine is good it does not need a circus to be sold, it follows that if you create a circus your wine must not be so good. By and large there is poor understanding of basic selling and basic marketing and our industry would benefit from some basic education in these areas. Carlo is right about identifying the need for leadership, because currently we do not have effective leadership. Those who know better have long figured out that they have to strike out on their own to be successful. The NYWGF has an impossible mission and must be all things to all people. As such it cannot be very useful at providing strong transformational leadership, in spite of the many useful little programs that it has developed over the years. The wine trails are ineffective as they spend most of their budget on salaries and have no play money. And their budget is too small to attract highly qualified promoters/marketers. The NYWGF must be reformed and adopt the concept of zero based budgeting. All the nice-to-have but strategically unimportant programs must be dropped. Even though it has organized good education programs, that mission belongs to Cornell which should take up that task. The NYWGF should stop funding the trails and use all of its funds (whatever is left) to do one thing but only one thing and do it well. My vote is to "Change the image of New York Wine" to match what the critic are saying. Perhaps in year one and with the recently limited budget it should use the money to hire a professional firm to develop the blue print for an effective PR campaign and put it out to bid. If it comes out with a credible program then it can use the suggestion I make below. The trails can fund themselves if they want. And if they choose to shut down their staff will be easily placed in the wineries. The NYWGF should devote itself to doing what none of the trails can do by itself and that is to put New York wine on the map. The industry needs to wake up and learn marketing and selling. With that here is a suggestion: Every winery spends a few thousand dollars on advertising in obscure media that has almost no impact. If all three hundred wineries in New York would contribute $5,000 per year ( the average advertising budget?) for three years to a professional PR campaign that would positively change the image of New York wine, a successful campaign might raise the demand for New York wine. If then this allows a winery to raise its average bottle price by one dollar, a 10K case winery will have added $120,000 in net income at the end of year three and every year thereafter. It looks like an investment that cannot be ignored. Yet I doubt that wineries have the self confidence to make such a commitment and I am not holding my breath. No one will give such a sum unless there is a credible plan that justifies such an investment. That is the opportunity that the NYWGF has. Will it seize it? Self reliance in the meantime is the best formula and perhaps some day someone else will have better luck at energizing the wineries of New York to see that they have a great opportunity. Very compelling insights; thanks Charles. I agree that the time is right for NY quality perception to catch up with reality. What are your thoughts on a quality system similar to Ontario's VQA? They implemented this to give consumers confidence of quality levels from their new wine region. I would be interested in working together on quality initiatives from NY's west coast. Let me know how I can help. I could not agree more with all your points. Thanks so much for your coming to the fore, because your voice is an experienced, successful, and mature one, which is defintely respected. Most strongly, I agree that we cannot wait for the government to help us. We need to learn better selling and marketing techniques, especially those used by competitive regions and countries, and find better ways to get our good news out. And there is a lot of good news in New York state wine. How come Paumanok Vineyards chooses not to be a member of the Long Island Wine Council? Having experienced countless public-relations image-creating and image-building campaigns in winedom, I am deeply skeptical of their value. Ours is an age in which society is drowning in advertising, in which bedrock reality and concocted imagery purporting to represent it are heading in opposite directions at an ever-accelerating speed. P.R. values and methods are fundamentally at odds with "transparency," the social-media fad word (but not fad idea) that on the street translates as "truth-telling." P.R. campaigns rely basically on ads, on spin, and in our guts we all know all commercial interests of every sort are spinning us to death. If you don't believe this "ask your doctor." So as a writer who focuses only on consumers' interests, not vintners' -- from my standpoint they can take care of themselves -- I'd suggest that the New York wine industry bring them into the stadium by playing what the Major Leagues call "small ball." Glitzy p.r. campaigns, invariably expensive, are ephemeral, leaving hardly a trace. But everybody benefits, in the long run, from patient spending year by year on the very best viticulture and cellar knowledge and matériel that money can buy. And riveting on excellence as a goal. And staying riveted. Nationally, "all politics is local," as the hoary Washington, D.C., maxim goes. And so is wine. If it's great -- even just superior -- local, especially in the Finger Lakes and on Long Island, it will sell in Washington State. reputation takes root that way, and stays rooted. And grows. And flourishes. P.R. imagery is evanescent, bringing little and leaving less. And, besides, when it is encountered it is distrusted. Since it is, by now, perceived as an inevitable adjunct of marketing, it is best left as just a minor adjunct to nitty-gritty programmed marketing, not as The Marketing Itself. The real work involves focusing on giving customers dependably good wine for their money, and by making it possible for them to find that wine. Producers have to do that by the old-fashioned wearing-down-the-shoe-leather practices of peddling it door-to-door, primarily in New York City shops and restaurants; that job goes with the uniform. And now, peddling it online. In the Darwinian wine market, New York is Action Central. If you can make it here, a certain Mr. Sinatra reminds us, you can make it anywhere. And, of course, in field and cellar you are literally making it here. The next step, Making It, really Making It, takes years and patience. That means Kareem Massoud ought to tell Charles, over a glass of their 2010 chenin blanc, which may well be a knockout, "Sorry, Dad, but I think your emphasis is wrong." I'm still cutting my teeth in the wine business from a home office in the Finger Lakes with just over 2 years in as a solo wine marketing and PR person. My head spins when I try to navigate all of the intricacies of the politics of our state's wine industry. I've chosen to keep those issues on the back burner and my focus beyond my client projects has been on listening, assessing and working to bring interested local wineries together to explore new technologies/strategies that may benefit them. Locally, we have established a chapter of the Academy of Wine Communications. What started as an idea to get together to discuss wine marketing and PR has evolved into a small community of winery staff, retailers, food & wine writers, tourism marketers, branding consultants and others looking to share their experiences with tools and other marketing/PR techniques. The goal is absolutely to help the wineries referred to by Charles as "Those who know better have long figured out that they have to strike out on their own to be successful." It's obvious that wineries need to develop strategies that go beyond what the NYW&GF, tourism agencies and wine trail programs offer them. I agree with Howard Goldberg and my observations tell me that a key strategy for the NY wine industry as a whole to elevate the collective image is for individual wineries to put a good amount of energy into their own individual winery marketing programs in conjunction with consistently producing great wine. One recommendation: build and continue genuine relationships with customers who now have a large voice and aren't afraid to share their experiences with their friends. Same holds true for media and bloggers. Simply showing up on Twitter, Facebook, at events and engaging them in conversation on a human level can solidify any future relationship that can benefit everyone. I've found that doing so without pushing an agenda long before your new release comes out or your annual event is being announced makes your outreach efforts much easier and a thousand times more pleasant. I feel that if many more NY wineries were to emphasize telling their stories themselves in between the press hits and wine reviews, our industry as a whole would benefit. Wow, there's a lot in here. I find Howard's comments particularly interesting, as they generally represent how I feel about the situation, and I came to my feelings after many years in the NY wine world, mostly spent in the Finger Lakes. Howard wrote about my now defunct small winery way back in 1985, and it appears that little on this matter seems to have changed since. I find it incredible that I don't know who Melissa Dobson is, but that shouldn't surprise me. The proliferation of PR possibilities that seems endless attracts PR people; some of us, however, could offer valuable insight, if we are asked to do so. The worst thing about the situation is that familiar refrain: why can't the industry work together? A refrain I have heard and used myself since 1985. The last winery owner with whom I talked and suggested a VQA-like system in the Finger Lakes responded with: "we don't need to follow a Canadian model." Obviously, not even if the model works! First I have enormous respect for Ursula, Charles and Kareem Massoud. Their individual and collective contributions to Long Island wine are noteworthy, and I have as much Paumanok Vineyards wines in my cellar as any Long Island winery. As I have had some interesting public and private debates with Charles on the value of “branding” Long Island wines to improve their “image” when I was Executive Director at the Long Island Merlot Alliance, I found his essay to be quite interesting, as well as the comments, in particular Howard Goldberg’s views. While there is no question that the results of excellent harvests of appropriate varietals from well managed vineyards and excellent winemaking by individual wineries are the only components that today and tomorrow will truly distinguish Long Island wines and improve their image, if only a small portion of the wine drinking population knows or experiences Long Island wines then the domestic and international recognition will simply not occur. If all the great Long Island wine is sold locally, no one in Seattle or San Francisco will ever know it’s great. And this is what “branding” is all about. It really differs from advertising, PR, media promotions and “circuses.” These are tools in the marketing and sales profession that are really used most frequently for targeted sales. And while retail sales are the key for Long Island vineyards and wineries to stay in business, these sales techniques rarely raise recognition and prices. To the contrary, these “promotions” tend to cause the retail consumer to sense an opportunity to buy at discounted prices which then leads to lower consumer opinions of a product and the expectation exists to always buy the product at a lower price point. Branding is promotion of “concept” which results in the opening of eyes, ears and for foods and beverages the taste buds to a “product”. In this case the product is high quality Long Island varietal and blends wines from outstanding producers. The HARVEST Wine Auction & Celebration of Long Island's East End this weekend is an excellent vehicle to showcase the best of Long Island wines, and hopefully in the future all Long Island vintners will participate. With the anticipated Wine Spectator and other media coverage there will be a window of opportunity for Long Island wines. My debates with Charles were on what really “brands” Long Island wines. While we may never agree on whether Long Island is/will be recognized for scores of varietals rather than a few select varietals (merlot, cabernet franc, chenin blanc, etc. ), his concept of a substantial budget for a PR campaign to promote Long Island wineries is most interesting. While I was at LIMA, I discussed with Steve Bate at the Long Island Wine Council the merits of promoting in mainstream publications. We had the opportunity to sponsor a feature article on the Long Island region in Bon Appetit. While such a campaign in Food & Wine or Bon Appetit may open eyes across the country, there is a legitimate question does such broad consumer awareness matter to the winery and vineyard owners bottom lines. As a point of comparison, I just returned from another trip to the Central Coast Wine Region of California to the Santa Maria Valley and in particular the Santa (Sta.) Rita Hills region of Santa Barbara’s Santa Ynez Valley. These small regions with approximately the same number of wineries as the East End of Long Island have far greater “image” in both the trade and with consumers. There are many reasons; I list a few: 1) Outstanding “named” vineyards that produce primarily chardonnay, sauvignon blanc and pinot noir varietal grapes for many wineries and wine brands such that the vineyard names are familiar to a cross section of wine people – the vineyards of Sanford & Benedict, Bien Nacido, Solomon Hills, etc. are on many labels , 2) Outstanding winemakers – Greg Brewer (Brewer-Clifton, Melville), Steve Clifton (Brewer-Clifton, Palmina), Kris Curran (Foley, Sea Smoke, Curran), Brun D’Alfonso (Sanford), etc., that are on the national stage, 3) Outstanding Wineries – Cambria, Melville, Foley, Zaca Mesa, and then most importantly consider 4) Outstanding Brands – Au Bon Climat, Brewer and Clifton, Sea Smoke, Sanford, Firestone, etc. Say the words Au Bon Climat and you immediately think of chardonnay, Sea Smoke – pinot noir, Sanford – sauvignon blanc. So how did they achieve this recognition given wine making started there approximately the same time Louisa Hargrave and her husband started on the North Fork? In my opinion 1) Santa Barbara, California to consumers just sounds more romantic than Cutchogue, Long Island, New York, 2) The wineries in Santa Ynez and Santa Maria Valleys did not have New York City and 18 million retail consumers two hours to the West, although they did have Los Angeles and 18 million people three hours to the South, but all the wine people went to the Napa and Sonoma Valleys for wine tourism/tastings. So they promoted, sold their products to distributors and formed wine promotion groups. The Santa Barbara County Vintners’ Association has been actively promoting the wines of the region since the early 1980’s. This survival instinct resulted in small producers such as Au Bon Climat, Sanford, Zaca Mesa, etc. to have their products distributed nationwide. Virtually all the winery owners and most winemakers make annual pilgrimages to San Francisco, Chicago and of course New York City to personally promote their most recent releases. Further, Japan was a targeted market and many wineries have direct distribution channels in Japan. 3) The entire Santa Barbara region has wrapped their collective arms around the wine industry as being good for tourism, consumers spending, and most of all being good for agriculture. The community support is a significant benefit to each vineyard and winery. In my opinion if the Long Island vineyards and wineries can see beyond their parochial interests and see a common purpose, engage the local East End towns and Suffolk County, and then perhaps selectively promote their best individual and regional products by well placed promotion and distribution (yes I am fully aware that there is less profit going through a distributor than via tasting room direct retail sales) and most importantly by having the winemakers and owners travel to Chicago, Seattle, and San Francisco, in addition to New York City, to show the best of Long Island wines to consumers, industry and media types, then the recognition and increased profitability are likely to follow. Unfortunately, retail shelves are not a meritocracy, where quality trumps all and the best bottles/values are gobbled up from store shelves while the plonk lingers and collects dust. Marketing works. Another familiar refrain: I’ve tried the wines. I like the wines. My customers don’t buy them. Many consumers buy and like what they are told to, directly or by image/reputation. Scores and write-ups in magazines are marketing, tastings and harvest events are marketing. There are many forms of marketing, and maybe advertisements and glitzy PR campaigns are not the answer. I agree that "small ball" may be the way to go, but I also think there can be a consensus on what the message is and how to deliver it. For this, the wineries do need to work together, and use an outside firm if the NYWGF isn't up to it, to develop an effective message and strategies to disseminate said message. It is BECAUSE of the overwhelming amount of information consumers are bombarded with that the region's producers need to work together and with, at times, one voice. Thank you for the kind words and I will let Kareem respond, if he wishes, to your invitation to tell me that my emphasis is wrong! The glass contains 50% of its capacity. We see the same glass yet we see it a little differently. PR campaigns are not always successful and I hope I did not suggest that. They need not be about advertising. Image building need not be about spin. There are enough clichés about bad PR that I do not list all of them. If in fact NY wines have reached a level of excellence that has caught the attention of major critics as well as large numbers of influencial sommeliers, there is a disconnect if in spite of that NY wines carry a negative image. A well conceived and executed PR campaign will surface this objective reality and lay it bare to educate the public. That there are pitfalls in PR is something I anticipated as I suggested that NY wineries are unlikely to sign on unless they can be convinced that such a campaign can be useful. That is a tall order. But that is not impossible. We have seen many wine regions come from no where to front row on the NY wine scene, while NY waited, the likes of Chile, South Africa, Argentina, Australia and New Zealand. And some older regions re worked their image with success such as Germany and most recently the Loire. Even Austria was able to overcome the glycol scandal and is today a major player. If this was done without PR then I must be misinformed. Napa organizes yearly events in NYC where proprietors and/or winemakers pour at simultaneous wine dinners in a blitz to announce new vintages. They may not need any more PR but that is PR at its best as they work to maintain a high profile. By and large we do very little as an industry and what we do has not been either very effective or very good. If you are suggesting we should stay he course, that is our plan as I have little hope that our industry will suddenly be seized with initiative and discover that it has the power to make a positive change. Nevertheless, and here perhaps you and I differ, our industry does have a choice as the current path will only reward those that will break out of the pack. By the way your column in the NY Times has contributed a great deal to increase the awareness of the NY Metro region to our wines. I thank you for that. The same can be said to some extent of the Wine Spectator and Robert Parker's Wine Advocate. Now imagine, as one example, if we were able replicate this kind of coverage with some regularity in the Newark Star Ledger or the Stamford Advocate, Newsday and their likes, through a good PR campaign. Also imagine if a smart PR firm would educate our industry as to how we can all participate in the new media by joining wine fora and other such electronic outlets. How else can we make the broader public aware of the quality of our wines, how else can we raise the image of our wines to make it reflect what the leading indicators suggest it is? And on another note, is it not a shame that we do not have a vehicle, as an industry, to have this kind of dialog to exchange ideas so that perhaps we might come out with a plan of action that get our industry out of its current lethargy? For that I am thankful to Lenn and his team for providing this facility as none other exists today for this purpose. Forgive me for not answering your question. If you wish to participate in a serious dialog please begin by identifying yourself. I've been following this debate since Carlo's original post - so let me throw in my two cents. I don't work in the wine industry, but I do work in the media, so I've found the discussion over PR and marketing to be an interesting one. We have to remember that PR and marketing is about much more than advertising. In fact, good PR and marketing should be absolutely free - or at least close to free. As Charles pointed out - the best marketing out there for NY State wines begins in the restaurants that now carry that wine. It begins with encouraging the wait staff to pour NY wines rather than others. Once customers taste that wine, they will be impressed. How do you make that happen? By targeting the chefs and wine buyers - NOT the general public. As has been said before (and as Charles aptly pointed out) the public buys what it's told to buy. If I walk into a wine store now and ask for a good red, or a nice Riesling, most of the sellers will point me to California, France or Germany, or maybe Washington State. And that's even at the bigger wine shops in New York City! Why? Because the sales staff hasn't been either told to push New York wines or given the incentive to do it. How do you remedy that? Simply put, by doing what Charles mentioned in his follow-up post: contacting the wine buyers and setting up a tasting session for them. Let them and their staff taste the wine. Give them a case or two to take home to their families or give to their friends. Let THEM spread the word. Do what the folks in Napa did in the 1980s. As for chefs, target them too. They want to serve the best to their clients, and with the "local and sustainable" kick in the food industry now, what better than to encourage them to serve local wine? I know - it's easier said than done. But it can be done, and it can be done cheaply. It only costs a few cases, a tank of gas, and time. If it works, though, it will pay itself back many times over. With all due respect it is not as easy as a few cases, a tank of gas, and time. Chefs and wine buyers are hammered everyday by importers/distributors that represent some of the best wines in the world. Until the idea of Quality (through self regulation or a formal system - preferred) is tied to the NY wine industry we are not in the game - no matter what kind of incentives (illegal in NY) are used. We must encourage, reward and wear on our sleeves a commitment to quality that rivals any AOC in the world. And yes, there are a handful of producers that already do this and are doing brilliant work but we need more to hit the tipping point. Making great wine isn't easy. Selling it is also not easy and even more difficult from lesser known regions like NY. I am encouraged by the progress I have seen in the state over the years and with the success of our own wines in the market place (Arrowhead Spring Vineyards). Local press, local restaurants and stores have been a major part of that success. Having said that, the local press has primarily been magazine specialty pieces rather than regular newspaper coverage. When we received our first spectator score we did a press release. No local paper picked up the story of the highest WNY score at that time. The NY post sent someone to the region to check out the wineries and attractions. That coverage was great for us and the region, but the NY Post is 450 miles away. Go to St. Helena in Napa and read their paper and you will find it loaded with wine news - why is it so difficult to find wine news in NY's papers for an industry that is growing so quickly? "...Until the idea of Quality (through self regulation or a formal system - preferred) is tied to the NY wine industry..."
You have got that right, but I have yet to see evidence in my neck of the woods (the Finger Lakes) that the industry as a whole is willing to do something like that. In fact, whenever I bring the subject up with local producers, the majority balk on the basis that "nobody or organization is going to dictate to me what represents quality." in light of your extended remarks that, I think, a proficient reader would reasonably see as urging collaboration and cooperation among New York State's producers for common purposes, the question asked above by "Suzy" seems keenly pertinent to this forum. I perfectly agree with your unwillingness to reply to what could be a pseudonym, but, more important, hers (his?) is a fair, relevant question. So I take it up here. Since you have chosen not to belong to the Long Island Wine Council, and that refusal seems to be at odds with your advocacy of collegiality, would you kindly fully explain in nuts-and-bolts detail why you remain an outsider? You usually tend to write at thoughtful length, so a longish reply seems in order. I appreciate that you might view the information as proprietary, personal and political, but transparent disclosure is also, I think, unavoidable. Especially because you have served as president of the council. It seems possible that the character and quality of your answer will govern how seriously the public will take your position. Of course we can have some fun here. - "The wine trails are ineffective as they spend most of their budget on salaries and have no play money. And their budget is too small to attract highly qualified promoters/marketers." When I have to ponder whether to fork out about $5000 in dues to be a member of the LIWC, versus finding another destination for such funds, such as, for example, giving a raise to my sons, it is an easy decision to make as they do a lot more to further our business than the LIWC. Frankly for much of the period 2000 through 2009 the LIWC was an embarassment for its mediocre performance. During that period Usula was a director of the council for several years during which she repeatedly pleaded to get the council to focus on marketing and promotion, to no avail. So we concluded that it was a waste of our funds and withdrew. I am encouraged by its new leadership and if they come up with a credible program for 2011 we will certainly take another look. Having said all this I thought you might have instead pursued the PR question, as more toughtful remarks were posted by Len Dest and others. After all if the industry was going to do something useful, our membership in the LIWC does not really matter and in this thread it is merely diverting the conversation in a gossipy direction. Your assertion that "It seems possible that the character and quality of your answer will govern how seriously the public will take your position." is questionable, as most of the public has no idea what the LIWC does or whether we are a member ot it. It is largely inside baseball. The lengthy answer you provided, while courteous, was simply intuitive to anyone who has read your words closely. Thanks for taking the time to do that, but it was a pretty silly insinuation from Howard. And, as you say, now back to the main event. Charles, I wonder what you think of some of the specific marketing or branding campaigns we've seen in recent years. One that seems to have been quite effective is the "Cahors is Malbec" campaign, though I've asked for some details on that. Any others that you would reference as successful? 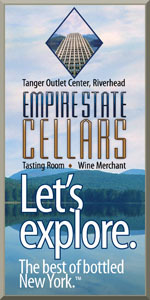 - What is unique about NY wine? - Is the industry ready to get into a major image campaign? To answer the last question first, I do not know how to gauge it, yet the silence of other industry members who usually post on your blog is revealing. If we are targeting the greater NYC market and should there be an industry initiative, what makes NY Wine unique is that all wineries are within a few hours driving distance. This proximity makes available several hundred foot soldiers available for the cause. If only 2 persons per winery on average participate in a coordinated program that makes about 600 people working on the message. No other wine region has that advantage. What would a "coordinated program" look like? First we need a professional firm to design what essentially is a tutorial about marketing and selling using NY Wine as a case study. That would lay the foundation for a grass root developed message for all these reps to carry forward to their customers and prospects, to their contacts in the media, on to various blogs and electronic media they partcipate in etc... Such a sustained blitz can be augmented by activities that take place today in isolation and out of context. Imagine if we were able to organize twice a year a "NY Wine week" in NYC where NY wine is poured at participating restaurants with industry representatives participating. I know that restaurants in the city are interested. If 100 restaurants participate, each pouring NY wine for 100 diners for 7 days, that adds up to 70,000 people who would have sampled NY Wine in a proper context. So long as we use our heads and pour our best wines it is a near certainty that it will register. Again these are "back of the envelope ideas". Details will have to be developed collaboratively, assuming there is interest out there beyond what we have seen so far. Don't the annual Foundation-sponsored NY Wine programs in NY City that already do what you propose regarding pouring NY wine in restaurants? Have there been results to pin to that program? Having attended many industry tastings in Manhattan, it was clear to me that the NY events paled next to the extravagance of other tastings, especially the Italian ones. Money seems the evergreen issue. 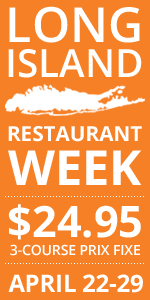 Are you familier with "restaurant week " in NYC? This is a twice a year event that gets wide publicity and restaurants offer prix fixe dinners. And we are talking here about important restaurants. If we take that format and build into it a "NY Wine Week", then the impact is considerable, as the number of participating restaurants is quite large. And the publicity alone is a lot more than anything we have been able to get on our own. If the Foundation does something like that, that is great but if I do not know about it, and I am an insider, that is a concern. And as I said in my reply to Evan "Such a sustained blitz can be augmented by activities that take place today in isolation and out of context." This applies to such activities that you are referencing. And here again I am using a quick example , "back of the envelope" as I said. What a more extensive program will include will have to be developed collaboratively. Yes, Charles, I am familiar with restaurant week. Didn't realize it's twice a year. Are you saying that you don't know about the Foundation's program in the city (which may no longer exist, but I know it did exist) where restaurants and retailers focused on NY wine for a certain period of time? I know that when I had my wine shop in Manhattan the Oyster Bar, Grammercy Tavern, Union Square Cafe, Peter Luger's and others were part of the program. The manager at the Oyster Bar told me that he dropped out because the program was too disorganized. Yes, I am imagining those 600 people you talk about blanketing the city at the same time to get the NY wine message out, like a small army. The Sonoma people did something almost like that a few years back, taking their show on the road to major East Coast markets. If anyone gets a chance, pop in on Oct 6 at the Amarone Tasting in Manhattan. See how it should be done. We have local restaurant week two times a year in Western NY. The focus is on local food and locally owned restaurants and wine is a part of that. It has been an incredible door opener and eye opener for restaurants who haven’t tried NY wine in a long time. This is run by a marketing company, proving that government money is not always needed when private industry concerns align and creative people are involved. http://localrestaurantweek.com. Having wine paired with food in a special dinner setting leaves a lasting impression and the restaurant operators get to experience how good quality NY wines and pair with food. NY wine and grape runs some farm market activities in the city – positive, but not as nice as having local food and wine paired together. I agree with what many have said here that their mandate is too broad to be effective for the fine wine producers. With such a broad mandate they can’t focus on one aspect of the industry. With 150,000 tons of native grapes crushed each year, dry vinifera wine is a niche product in NY – 7500 tons crushed last year. That niche is what the international market and major urban centers expect wine to be. The marketing needs of each producer type that NY Wine and Grape cover are very different and aimed at very different consumers (juice, jelly, sweet wines and dry wines). Perhaps it is time for wineries who specialize in dry, food friendly wines to band together for marketing purposes, working with NY Wine and Grape and other groups where it makes sense. Anyone else think this is a good idea? I am surprised after all of these years, they never considered hiring a consultant to help with their business plans. But when you've been successful for so long, it's hard to get away from what has made the company what it is today.